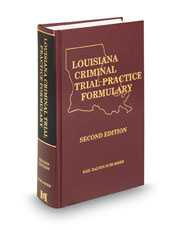 Louisiana Criminal Trial Practice Formulary provides a sampling of motions to cover every aspect of criminal trial practice in Louisiana. The forms have been drafted in as generic a manner as possible, so you can easily tailor the forms to the specific fact situations of your case. A sample of administrative forms used by law enforcement agencies and other administrative agencies within the criminal justice system is included.